On April 9, the Congressional Budget Office (CBO) projected that the federal budget deficit will rise to $804 billion this year and $1 trillion in 2019 - largely due to the new Tax Cuts and Jobs Act of 2017 and the $1.3 trillion omnibus spending packaged approved last month. The CBO report also indicated that the debt burden (i.e., the total amount the government owes relative to the size of the economy) is projected to reach 96 percent of GDP by the end of the decade, its highest level since the end of World War II. The White house continues to consider utilizing a provision of the Congressional Budget and Impoundment Control Act of 1974 to cut billions of dollars in spending from the bipartisan omnibus funding deal passed March 23. The process would be a rescission resolution requiring a simple majority vote by the Senate. It appears unlikely that such a resolution would be successful. Action Item: The most effective way to protect FY 18 funds is to continue educating and advocating around LEND and UCEDD funding for FY19. Your messaging to the Senate around FY19 will serve to reinforce the importance of the FY18 funding and is a clear reminder to not adjust the FY18 agreement. 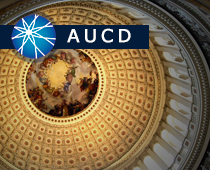 Please use the AUCD Action Center to send an email (which you can personalize) to your Members of Congress advocating and/or educating about the importance of LEND, and advocating and/or educating about the importance of UCEDD. On April 12, House Agriculture Committee Chairman Michael Conaway released the draft Farm Bill "Agriculture and Nutrition Act of 2018" with markup planned for April 18. AUCD is concerned that this proposal includes damaging cuts and creates barriers to accessing Supplemental Nutrition Assistance Program (SNAP; formerly known as the Food Stamp Program), free school lunches, food banks, and other essential food benefit programs that low-income Americans relay on. Under current law, adults ages 18 to 59 who are "not pregnant, disabled or otherwise exempt" are required to work at least a part-time job or agree to take a job if it is offered to them. An additional set of work requirements applies to "unemployed childless adults", who lose benefits if they are unable to find a job in three months. The Conaway proposal would establish a single work standard for adults ages 18 to 59, requiring any adult in that age range to hold at least a part-time job within a month of receiving benefits or enroll in 20 hours a week of workforce training to receive assistance. Preliminary Congressional Budget Office estimates suggest the requirements would cut SNAP participation by as many as 1 million people over the next 10 years. AUCD will continue to monitor this bill and educate legislators on its potential impact. Please see Additional Majority materials and Minority press statement. Action Item: use this pre-crafted letter (that can be personalized) to educate your Member of Congress on the importance of food security. The Empower Care Act, to reauthorize MFP, is gaining co-sponsors! As of April 11, Representatives Meehan (R-PA) and Schakowsky (D-IL), and Senators Collins (R-ME) and Casey (D-PA) have signed on as co-sponsors. For a full list of co-sponsors please view Senate and House. Action Item: Continue educating your Members of Congress on the importance of MFP - particularly those members on the House Energy & Commerce Committee - in order to ensure that MFP is reauthorized and people with disabilities have access to their community. Please use this toolkit to help with your advocacy. Bill numbers: EMPOWER Care Act - S. 2227 and HR 5306. The Autism CARES Act of 2014 reauthorized the Combating Autism Reauthorization Act of 2011 for five years. Due to "sunset" language, this law is set to expire if it is not reauthorized by September 30, 2019. The law has helped to expand research and coordination at the National Institutes of Health (NIH), increased public awareness and surveillance at the Centers for Disease Control and Prevention (CDC), and expanded the interdisciplinary and inter-professional training of health professionals to identify and support children and youth with ASD and their families through programs of the Health Resources and Services Administration (HRSA), such as LEND. State of play: it appears likely that Congress will take up the reauthorization process this session. Action item: now is the time to reach out to your congressional delegation and educate them on the work that you do as related to Autism CARES (LEND, state plans, training of developmental behavior pediatricians, lifespan services and supports, etc.). Additionally, you are encouraged to invite members of your delegation to join the autism caucus. On April 9, the Department of Health and Human Services Notice of Benefits and Payment Paraments for 2019 final rule was released, which includes CMS standards for issuers and Exchanges, for plan years beginning on or after January 1, 2019. This fact sheet highlights: Increasing Flexibility regarding Essential Health Benefits; Qualified Health Plan Certification Standards; Navigator Program; Strengthening Program Integrity; Reducing Unnecessary Regulatory Burdens; and more. Please also see supplementary information. On April 12, the President announced his intent to nominate Andrew Saul of NY to be Commissioner of Social Security for the remainder of a six-year term expiring January 19, 2019 and for an additional six-year term expiring January 19, 2025 as well as David Fabian Black of ND, to be Deputy Commissioner of Social Security for the remainder of a six-year term expiring January 19, 2019. The Trainee Orientation webinar which highlighted what you can expect and how you should prepare, is now available via archive. Also see rerun of Tuesday's with Liz below. The Tuesdays with Liz series is taking a break while Liz Weintraub is on detail working with the Senate Aging Committee. Tuesdays with Liz will return to a regular taping schedule and new episodes will air in the late Spring when Liz returns to AUCD. Until then, we will be highlighting some of our favorite Tuesdays with Liz episodes from this past year here and on social media at @AUCDnews. The Disability Policy Seminar (DPS) is just around the corner! To find out more about what goes on during DPS, tune in to this previously aired 'Tuesdays with Liz' where Liz gave a rundown of what to expect for the 2016 Disability Policy Seminar.